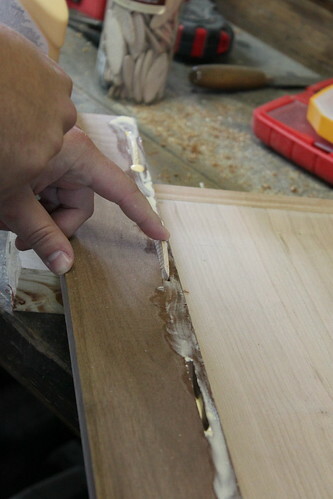 First, dimensions of the surface to be covered are measured, and the plywood subcounter is cut to shape. 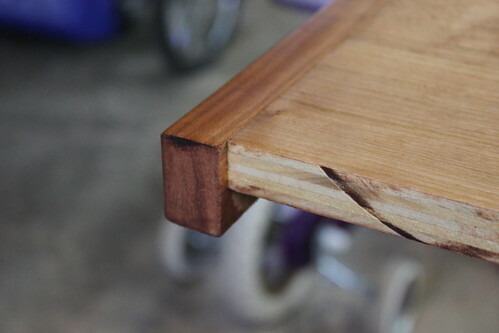 Screw this into cabinet sides immediately so the kitchen can be used. We lived with construction plywood counters for just about a year, so I suppose you could just stop here if you were ok with counters that can't be thoroughly cleaned and are pretty ugly. 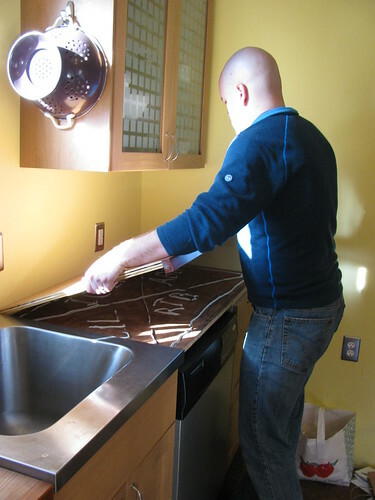 Care needs to be taken with complex shapes so that the dimensions are accurate and the countertops fit when installed. I worked in the garage and made trips inside many times to measure, dry fit, and trim. 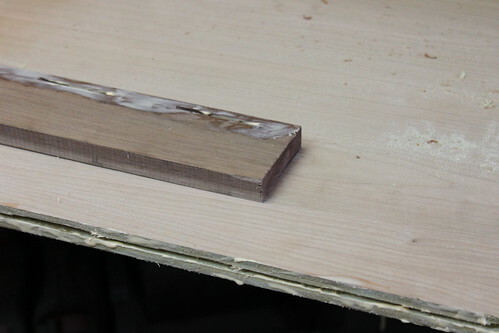 Next, the solid wood edge pieces are cut to length. 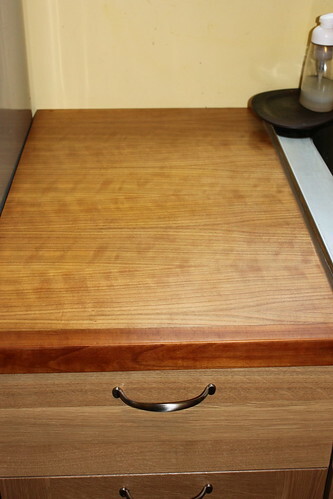 I fashioned the edge pieces to hang down so that the edge makes the countertops appear to be 1.5” thick. Now the edges are installed on the sides of the plywood using the biscuit jointer. For those unfamiliar with a biscuit jointer, it cuts slots in both edges of wooden pieces on their butted sides. Wood glue is inserted in the slots, biscuits inserted in one side, and the pieces are fit together. They are clamped and allowed to dry thoroughly. The entire assembly is finish-sanded to 220 grit and then the polyurethane is applied. 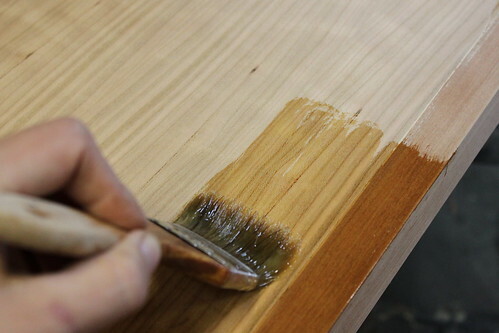 I let each coat dry completely, and then roughed the surface with 00 steel wool before applying the following coat. I applied 6 coats of polyurethane and then finished it by buffing with 0000 steel wool. If we notice down the road that the polyurethane is damaged or wearing, we can simply sand and then re-coat with additional layers as needed. After this, the countertops are dropped into place and secured with liquid nails. 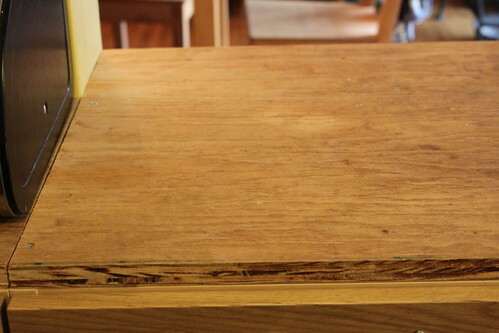 With a generous application of liquid nails between the two sheets of plywood, you essentially have a one-piece solid surface. Edges around the sink are protected with clear silicone caulk. We are thrilled with the look and feel of the wooden countertops. The cherry contrasts just enough to be pleasant and not distracting. They are simple to clean and in the month since installation show not a single scratch. We look forward to years of enjoying the beauty and function of these affordable counters.